Match the shapes and colors! This fun manipulative helps children practice geometric recognition and counting as well as color and shape sorting skills. 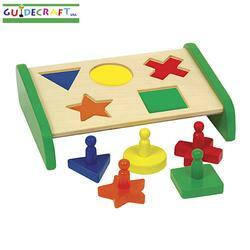 Color-coded shapes and base, and easy-grasp handles, aid young children in successfully completing the puzzle while developing fine motor skills. Play surface is raised to accommodate floor or tabletop play. Safe non-toxic paints with a clear finish; smooth rounded corners and edges; and a sturdy construction guarantee years of creative learning and play.